The Bank of British Columbia was an international organization and was backed by British Capital. This building was their headquarters and was also the largest office building in British Columbia when it was built. Warren H. Williams was a Portland, Oregon architect who also designed Craigdarroch Castle. Built in the Renaissance Revival Style, its design is derived from the 16th century Florentine banking palazzos. To emphasize the corner entrance of the main banking room, a Greek gable is mounted above the entrance. Above that in a roundel hovers Mercury, the Greek god of commerce. Opened on March 1, 1886, the bank featured cast iron pillars, lintels and windows sills were made in Albion Ironworks. Total cost of construction was $50,000. The site on which the bank is located is where the former bachelor’s quarters of Fort Victoria stood. 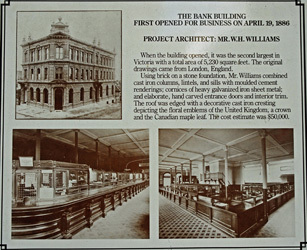 Soon after 1900, the Bank of British Columbia was absorbed by the Bank of Commerce. In 1903, the Bank’s most famous employee, Robert W. Service – the Bard of the Yukon – worked at a salary of $50 per month and lived above the bank vault that he guarded. He transferred to Kamloops in 1904 and then to Whitehorse. 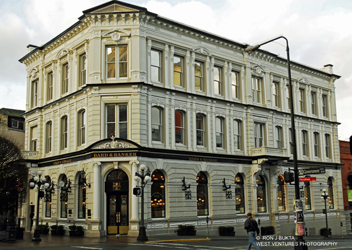 In 1907, the offices above the bank were occupied by T. J. Jones – dentist, B. C. Development Association, E. Crow Baker – financial agent, Victoria Bank Clearing House, L. M. Mills – art studio, and B. C. Deposit and Loan Co. Ltd. The Bank of Commerce closed this branch on January 15, 1987. It was then turned into a Christmas store. In 2008, the vacant building was acquired by publican Matt McNeill who transformed the former bank into the Bard and Banker Pub.